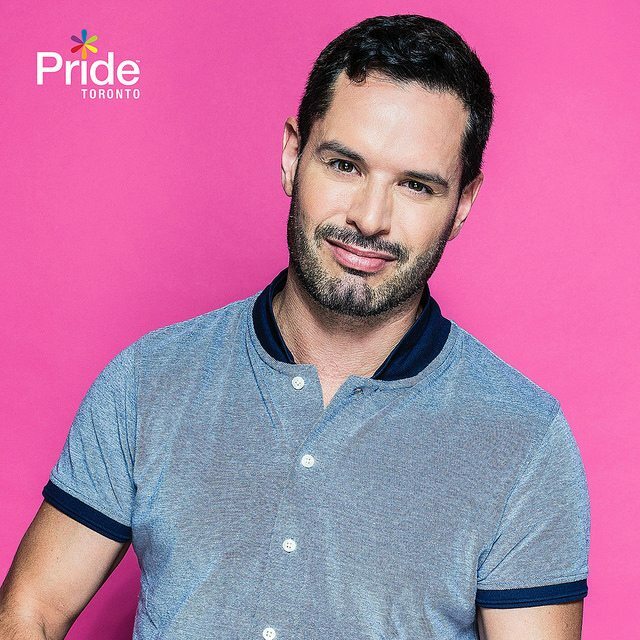 Mathieu Chantelois is Pride Toronto's executive director, an ex-reality TV star—and a queen bee. Photo courtesy of Pride Toronto. Mathieu Chantelois bounds up and down the stairs at The 519 community centre two at a time, as if he owns the place. The centre is hosting its St. Patrick’s Day pub night, a ticketed event, but he waves me through without paying. 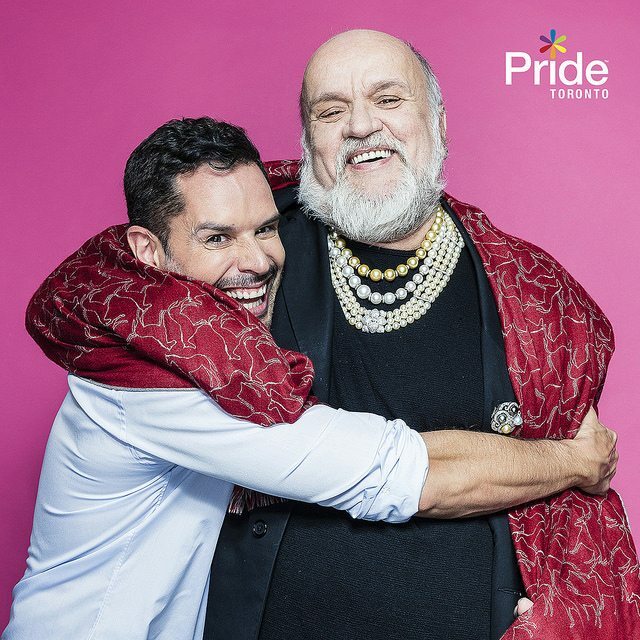 “I raised millions of dollars for this place,” the hyperactive executive director of Pride Toronto says breezily—$11 million, to be precise, though in this enterprise he was assisted by Salah Bachir, his long-time friend, mentor, and benefactor. Upstairs, Chantelois enters the party to a whirlwind of air kisses, affectionate hugs, and enthused greetings. He warmly greets Bill Coulter, CP24’s morning weather man, who also helps host events like the beer garden during Pride. This year, Chantelois informs him, they will try to get him projected onto the gigantic screens in Dundas Square. “It will be yuuuge,” he exclaims, theatrically flinging his arms so wide that nearby party-goers lean out of the way. Chantelois was born in Quebec and, at 42, he still speaks with a heavy accent. Years ago, he taught himself English by binge-watching Oprah Winfrey and Jerry Springer. It shows in his ebullient manner of speech. In many ways, Chantelois is the charming, polished product of television: he is compact and photogenic, with an exceedingly broad smile. He first became famous as a resident on U8TV: The Lofters, an early 00s Toronto reality TV show, and was once an aspiring talk show host. Instead, he now oversees one of the biggest and most iconic events in the city. Fittingly, for Chantelois, this year Pride Toronto will take as its catchphrase a line adapted from Mean Girls: “You can sit with us.” If the gay community were a high school, there is no doubt that Chantelois would rank as a Plastic. As Pride has grown from a small but political picnic on Hanlan’s Point to a multi-million dollar affair involving hundreds of thousands of revellers, it has also come to require leaders who are capable of maintaining the kind of high-powered relationship that Chantelois shares with the upper echelons of Toronto society, like Bachir—all without losing touch with the event’s origins in social justice and activism. It will take real political savvy to preside over what is expected to be the biggest and most expensive Pride to date. This year’s festivities will run longer than ever, stretched over the entire month of June. Pride Month involves the usual alphabet soup of queer groups, as well as dozens of Toronto institutions and the leaders of all three levels of government. And somehow at the helm of this epic production is Chantelois, an ex-reality TV star and social chameleon who is always ready to play to type. He seems equally at home among the drag queens in the Village and the bankers on Bay Street, which, at this point in Pride’s existence, is a pre-requisite for the top job. Chantelois was born in 1973 and raised in Mascouche, an off-island suburb just outside Montreal. His father, Claude, was the head of human resources for the National Film Board, and his mother worked as a schoolteacher; his younger sister, Emilie, is also now a teacher. At 13, Chantelois moved to the city to attend Pierre Laporte High School, which specialized in teaching music, where he played the piano and befriended Rufus Wainwright. He came out in his 20s, before heading to Australia to study for his master’s in journalism. His family was accepting. Chantelois did not intend to become a reality TV star. After returning to Canada from Australia, he worked as a reporter at Voir, a Montreal weekly similar to NOW magazine. His editor dispatched him to Toronto to cover the audition process for U8TV: The Lofters, one of the first Canadian reality television shows. The program was filmed in Toronto and aired six nights a week in a prime-time slot on the now-defunct Life Network in 2001. His most popular segment involved paying straight men $100 to go gay-for-pay, with five million views on YouTube. But Chantelois—ever the politician—had the clip removed years later, when he was applying for a job. The premise was basically Big Brother, with an exposed-brick loft instead of a McMansion. Eight contestants were squeezed into the 1,000-square-metre space in the Entertainment District. Two dozen cameras live-streamed their activities online 24 hours a day. In an added twist, each participant was asked to create and produce episodes of their own show-within-a-show, exponentially increasing the amount of content for its creator, Alliance Atlantis. At the auditions, Chantelois observed that most people were acting “too basic or generic,” appearing awkwardly before a panel of producers for a few seconds before shuffling offstage. Instead of interviewing those lined up for his story, Chantelois joined the queue himself. Reality TV was then still a novel concept—Survivor had just finished its first season—so no one seemed to know quite how outrageously to behave. But to Chantelois it seemed to come naturally: when it was his turn, the producers asked what he would do if he had to interview Britney Spears. Chantelois took off his shoes, removed a sock and put it over his arm like a puppet, and conducted a mock interview. He was chosen, and agreed to spend the next year of his life in front of the cameras. Chantelois chats with reporters on Pride’s Media Day. Photo courtesy of Pride Toronto. With so much raw footage, the producers were able to edit the show to present each Lofter as an archetype, with Chantelois as the token gay. It was a double-edged sword: on the one hand, a valuable publicity opportunity, and so Chantelois allowed himself to be followed by a camera crew as he went to get tested for HIV. On the other hand, Chantelois says it made his experience on the show uniquely burdensome. All the Lofters would receive fan mail, but his was different: a letter from a boy in Winnipeg whose parents wouldn’t let him watch the show after they saw Chantelois kissing his partner, Marcelo, or an email from a teenager in Sudbury expressing suicidal thoughts. Eventually, the show’s producers had to assign someone to help draft Chantelois’s responses. Nevertheless, Chantelois embraced his archetype. His show-within-a-show was called SoGayTV. Chantelois says his ambition with the program was to present a version of gay life that was not freighted by somber discussions of HIV-AIDS: “I wanted to show that it was okay to be gay.” The most popular segment he produced involved paying straight men $100 to go gay-for-pay. It racked up more than five million views on YouTube, but Chantelois—ever the politician—had the clip removed years later, when he was applying for a job at the Boys and Girls Club of Canada. Upon his return, Chantelois worked a series of odd jobs, mostly as a French-speaking television reporter, until someone tipped him off about a job: Famous Player’s in-house magazine was hiring an editor. After a series of interviews, Chantelois was summoned to a face-to-face meeting with Salah Bachir, the multi-millionaire philanthropist and media mogul. Bachir is a singular presence in Toronto’s egoscape. Born in Lebanon, he grew up in Rexdale and now lives in a palatial lakefront condominium that also displays his expansive 3,000-piece art collection. The Globe and Mail has described Bachir as the Cosimo de’ Medici of Canadian art for his role in fostering new talents. But the comparison is also apt because Bachir sometimes dresses in velvet draperies, bejewelled brooches, and his signature hoops of necklaces. Chantelois and Bachir. Photo courtesy of Pride Toronto. Today, Pride is more a party than a protest—and parties cost money. Chantelois’s remark became a running joke between them as they worked the city’s gala circuit: the Governor-General Awards, Bloor Street Entertains, Fashion Cares. In time, the two became close friends, as well as colleagues. “I call Salah my dad, and he calls me his son,” says Chantelois. He is by Bachir’s bedside during his dialysis sessions and spends occasional weekends at his estate in Paris, Ontario. Last October, they jetted off together with friends and family for Bachir’s 60th birthday party in Paris, France. And this year, Bachir will serve as a grand marshall in the Pride Parade. Those fundraising relationships have become increasingly critical to the role of Pride’s executive director. In its early days, Pride was explicitly political, a march that could be done on the cheap. Today, Pride is more a party than a protest—and parties cost money. “He’s very personable, and people like him and that’s half the battle,” Salah Bachir says. Chantelois, on the other hand, doesn’t seem too chuffed up about Pride’s corporatization over the years. Rather, he seems genuinely passionate about making Pride Toronto the biggest and the best that it could be. He was hired the year after World Pride and at times, that can seem to be a chip on his shoulder. As he often points out, last year he had only four months to pull everything together. This year, he has been working frenetically for a full 12 months. “Coming out of World Pride, the board of Pride Toronto and the organization itself had a ton of ambition,” says Aaron GlynWilliams, who helped hire Chantelois and serves as co-chair of the year-round organization that runs Pride. “When we saw the city’s response, and the way that the festival was embraced by so many different organizations and institutions—we didn’t see that as a one-off success story, we saw what was possible for our festival in the years to come.” Chantelois, GlynWilliams adds, was the right person to make that happen. Chantelois claims to operate by a certain code, a self-imposed separation of church and state: the partner is never allowed to influence the substance of the programming. He flatly refuses to allow corporate sponsorships of any trans programming, explaining that in terms of political progress, “frankly we’re not there and we should just give back and not even think about brand recognition.” Earlier this year, he claims he rebuffed an effort from a major sponsor—he won’t say which one—to rename the main Pride parade, in the manner of the former Scotiabank Caribbean Carnival. The Dyke March, a celebration of lesbian, bisexual, and trans women on the day before the main Pride parade, is widely regarded as the more radically queer of the two. The march began independent of Pride and was only subsumed into the organization in 1996. In recent years, some volunteers have hacked off or covered up corporate logos on the t-shirts provided by the festival. In particular, some Dyke March volunteers object to wearing the TD Bank logo. The bank maintains a security-related policy by which customer service can lock a client out of their account if, for example, the client sounds insufficiently feminine and the account is registered under a woman’s name. Activists say this policy is transmisogynist, and Milloy says she raised the issue with Chantelois at a meeting in January 2015. Chantelois says he has raised the issue with his contacts at TD, and that he is satisfied with the bank’s efforts. He grants that the bank is not perfect, and the policy remains on the books. There are around 20 to 25 regular sponsors who financially support Pride year after year. (Chantelois says he prefers the term partner.) TD is one of them, and the bank gave a record amount to Pride Toronto in 2015. Though Pride employs two full-time staff whose job it is to maintain those relationships, Chantelois handles some files personally. He has been friends with Ben Smith, the President of Passenger Airlines of Air Canada, for 20 years. No surprise, Air Canada is a long-time sponsor and will return again this year. 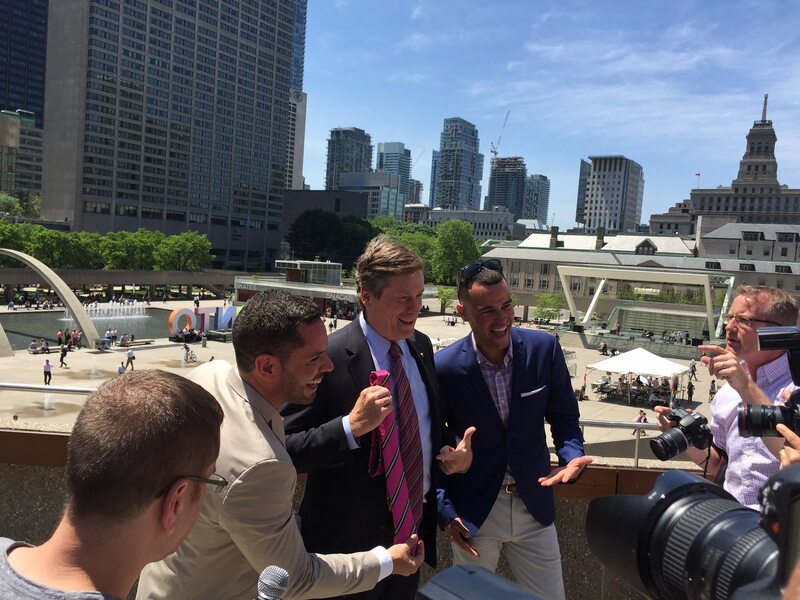 Chantelois, Mayor John Tory, and Aaron GlynWilliams pose at Toronto’s Pride flag raising. Photo by Erica Lenti. Maintaining those relationships is a key part of Chantelois’s job. “He’s very personable, and people like him and that’s half the battle,” says Bachir. Chantelois says he learned a lot from his old boss when the pair sat on the board of The 519 community centre and attended a frenzy of fundraising lunches—including the art of The Ask. At a lunch with Scott Mullin, the executive vice-president at TD Bank responsible for corporate donations, Chantelois says he had to learn how, “at the end of it, you have to say: ‘So, do you think you can do a brunch and raise $50,000 for us this year?” This year, TD Bank is giving more than ever. In his interview for the job of executive director, Chantelois held up a list of names and told the hiring committee, “These are the people that I know, and I think I can convince them that they can give more money.” And give they did: this year, the operating budget for Pride will be an estimated $4 million, a 25 per cent increase from 2015. In an interview in Pride’s headquarters on Berkeley Street, I asked Chantelois whether someone who didn’t have the same experience of moving in such moneyed circles could do his job. He paused before answering that “they would do a different job,” adding diplomatically that this hypothetical other person would surely be better at other aspects of the job—maybe just not fundraising. “Major decision-making roles in Pride Toronto are occupied by cis[gender] white men,” noted Milloy in her open letter. Though Pride’s board now includes three members of the trans community, Pride Toronto, unlike many cities, does not have an “operational” board of directors; instead, the board (which is more diverse now than ever before) oversees Chantelois’s work at arms length. GlynWilliams, the co-chair of the board, grants that the pool of candidates for executive director was not exactly “full of colour and diverse,” though there were some women considered for the position. News of Chantelois’s hiring was greeted with disappointment by the grassroots of the organizations he formerly led; upon being informed of his hiring, a group of volunteers at The 519 demanded to know why another cisgender, privileged gay man was appointed to lead a movement that professes to be committed to diversity. “People were not willing to give me a chance because I was a male and because I was white,” Chantelois protests. Chantelois’s predecessor was Kevin Beaulieu, a veteran of Toronto City Hall who worked with councillors Adam Giambrone and Kristyn Wong-Tam. Beaulieu spent much of his term attempting to strike a balance between the controversial Pride group Queers Against Israeli Apartheid (since disbanded) and City Hall, which threatened to withhold $123,807 in funding if QuAIA was allowed to march in the parade. Before Beaulieu, Pride was run by a woman named Tracey Sandilands, a veteran of Pride festivals in South Africa, whose term was marked both by successes (a winning bid for 2014 World Pride) and scandals (accusations of nepotism for hiring her wife to work on the Pride website and running a deficit of nearly half a million dollars in 2010). Chantelois says he has privately struggled with his own privilege. “People were not willing to give me a chance because I was a male and because I was white,” he protests. But he is also unapologetic about occupying his role. “If I use my privilege to give these people a meaningful voice, not just a tokenized voice, then I should not be ashamed of being here,” he says. One of the biggest changes Chantelois has made to the festival is offering certain stages a cohesive, racialized theme. Last year, one of the biggest stages was Bollywood-themed, programmed with an organization called Besharam (which describes itself as a “garam masala of sexualities and cultures”). In March, Pride announced that the Toronto chapter of Black Lives Matter would be leading the parade as grand marshals, but one former member of Pride’s board of directors suggested that the move was calculated to counteract this very criticism of Chantelois. Shortly after his hiring was announced, a former producer of Lofters emailed Pride to warn that Chantelois was duplicitous, not committed to diversity but merely playing a role, the same way that he did on the show. The month ahead that he describes features a sprawling, ambitious series of events that will see Pride spill beyond the border of the gay village and take over the entire city: there will be marches, memorials, and human rights panels, but also parties at the Royal Ontario Museum and the Art Gallery of Ontario, films at the TIFF Bell Lightbox, and concerts with the Toronto Symphony Orchestra. Chantelois references Pride 2016’s “You Can Sit With Us” motto during the organization’s photo shoot in January. Photo courtesy of Pride Toronto. Chantelois’s fingerprints are everywhere on the calendar: during his time on Lofters, he became close friends with the cast of Queer as Folk, which was filmed in Toronto around the same time, largely in the local gay dance club Fly (or Babylon, as it was known to viewers). This year, to celebrate the tenth anniversary of the Queer as Folk finale, Chantelois will convene the former cast members and host a party at Fly. His old high-school friend Rufus Wainwright will reprise Judy Garland’s famed Carnegie Hall comeback performance in a concert at the Hearn. For months, Chantelois and the board thought about what message the festival should convey in its marketing and public image. In the past, says GlynWilliams, the festival was focused on messages of acceptance and equality from the external, heterosexual community. 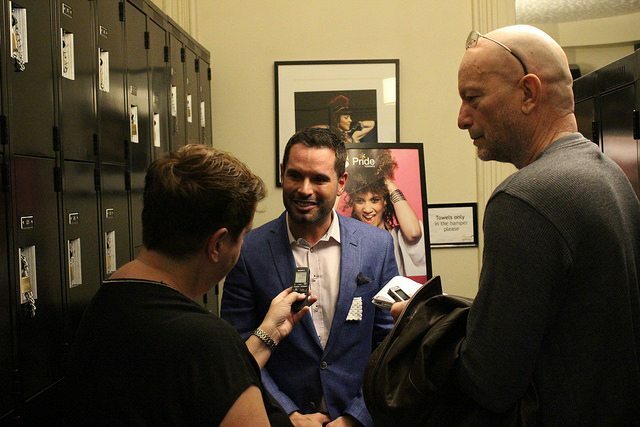 “We haven’t really spent a lot of time breaking down discrimination and bias within the LGBT community—really accepting each other,” he says. It’s a feel-good theme, pure Chantelois—even if it’s inspired by Mean Girls. Naturally, the film will be screening down by the Waterfront as part of the Pride festivities. Wear pink. CORRECTION: A previous version of the article incorrectly spelled Mathieu Chantelois’s partner Marcelo’s name, and misstated that Christin Milloy was a former Pride Toronto board member. Torontoist regrets the errors.